Tillman’s greatest appeal to me, over the last 12-or-so years that I have been a regular visitor, is that one never knows quite what will be found on any visit and ‘drawing a blank’ is rare. This time, I turned up two new insect species I had never before seen or photographed: a male Carolina Saddlebags dragonfly (Tramea Carolina), and what – to the best of my very limited ability with moths – I believe to be a White Spring moth (Lomographa vestaliata). 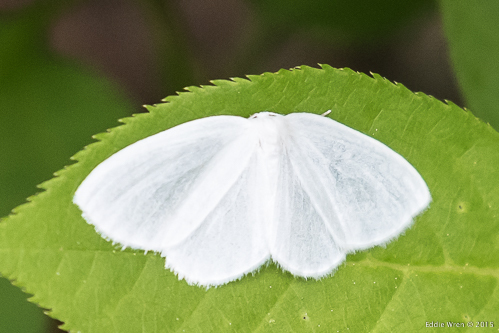 The latter sat motionless on a leaf, to the extent that I wrongly presumed that it would be some sort of ‘bird dropping moth’ but the former was on high-speed patrol along the margin of a pond and settled only briefly, each time, before doing another lap of its territory. I’ve been very careful in identifying the dragonfly because it is very similar, in both appearance and range, to the Red Saddlebags (T. onusta) but I’m fairly confident I’ve got it right… However, as is always the case on my blogs, if anyone recognizes that I’ve made a mistake please do add a comment below to put me right, and I will correct any error. 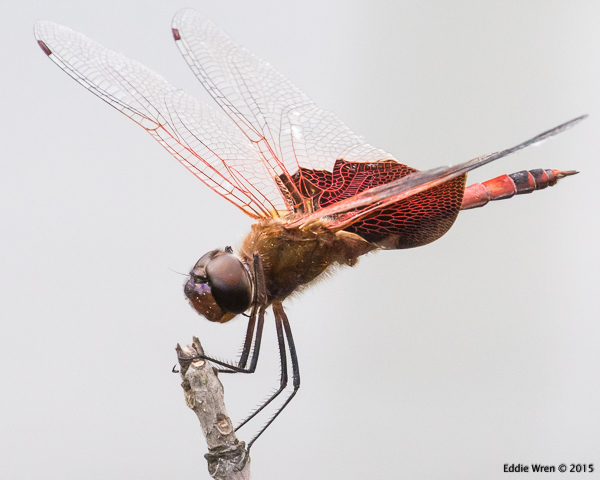 The various species of ‘saddlebags’ dragonflies get their name from the dark patches on the inner section of their wings, and when seen – usually in silhouette – from below, this creates an outline that looks like what the name says. Up where we were, close to Lake Ontario, the Carolina is fairly close to the northern limit of its range, which is over the border in southern Ontario province. Even in this part of New York State, it is further north than its usual breeding range. 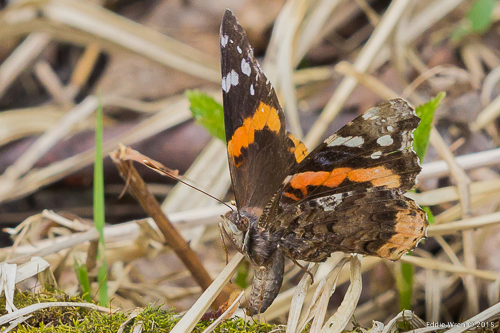 My other insect of the day was a rather worn-looking Red Admiral butterfly (Vanessa atlanta) which – to my surprise – was laying eggs in low, rough vegetation where I could see no trace of any of the future caterpillars’ necessary food plants. 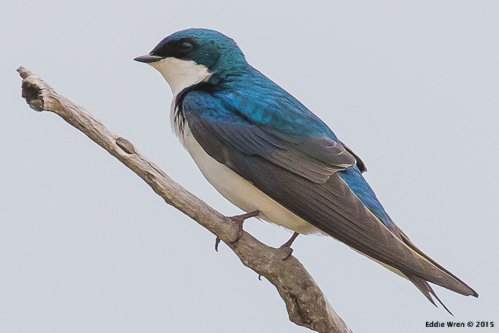 Does a first-brood adult lay eggs randomly around an area in the hope that at least some of their offspring will find suitable food after the plants all grow? Or was this one operating by smell (chemical sensing) and by that means actually knew the right places to leave eggs? 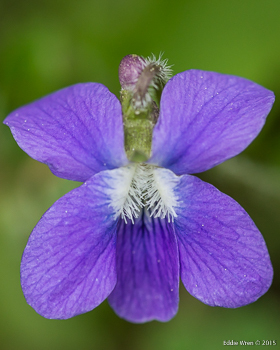 As for the other photographs, well I’m always a sucker for violets and I’m not going to walk past a ‘posing’ Tree Swallow, either! This entry was posted in Behaviour, Birds, Butterflies, Dragonflies (Anisoptera), Eddie Wren - articles by, Egg-laying, Habitat Types, Hirundines, Insects, Moths, NY State, NYSDEC, Odonata, Photography - Wildlife & Nature, USA (preserves), Water Bodies and Wetlands, Wildlife - Nature - Natural History, WNY (preserves), Woodland or Forest and tagged Butterflies, Dragonflies, insects, Lepidoptera, Moths, nature photography, Odonates.